Found on Trove – Bacchus Marsh Express – Saturday 25 March 1905.- HISTORICAL ACCOUNT OF THE FIRST DISCOVERY OF BLACKWOOD. (By M. J. CROKER, Mining Registrar, Blackwood.) The great excitement caused in all parts of the world by the discovery of gold in South America and California had hardly subsided, when it was closely followed up, in 1851, by the wonderful discoveries of apparently inexhaustible deposits of precious metal in the Australian colonies. 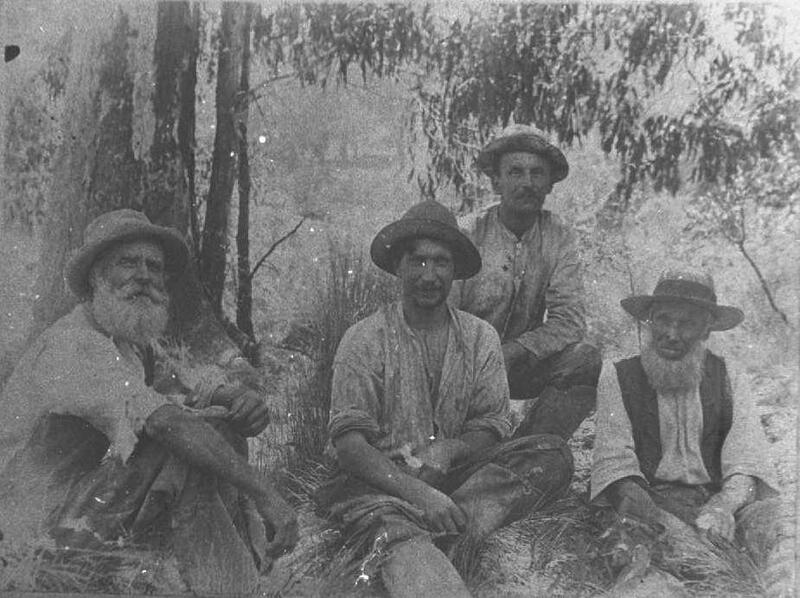 As this is the jubilee year of the discovery of the Blackwood goldfields, a few remarks relative to that event have been asked for by the old pioneers here. In 1855, there were fifteen goldfields in full operation, namely, Ballarat, Bendigo, Mt. William, Avoca, Mary borough, Tarrengower, Anderson’s creek, Plenty ranges, Mt. Alexander, Mclvor, Goulburn, Ovens, Simpson’s, and Daisy hill. Enlarged photo of mining in Barrys Reef – (From and old glass negative courtesy .A.E. Seaborn), showing Mullock heap of the Sultana mine in front left, and Mounter’s poppet head behind it. Sultan Mine mullock heap in background. (Enlarged photo courtesy of Barry Thurgood) C. 1881. 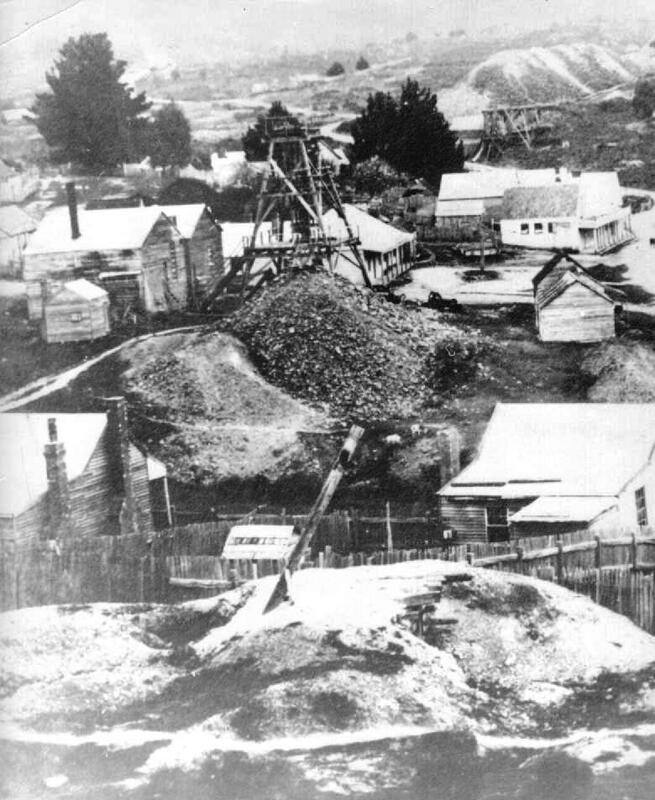 Gold was first discovered in Jackson’s Creek, at Golden Point, Blackwood, in the summer of 1855. The historical discoverers are recorded as Messrs. Jackson, Densly, Haythorn, and John Swain (uncle to Mrs. Murphy, of Trentham). Jackson, the discoverer, was a mate of Matthew Sweet, father of the present family of that name on Blackwood. He was working a saw-pit at Mt. Blackwood, cutting timber for house building purposes, before he discovered the Blackwood diggings; but he left Sweet, and started droving cattle from Harper’s run at Woodend through the Blackwood ranges to Ballan and Ballarat. In crossing the creek now called Jackson’s, to fill his billy with water, he picked out a nugget of gold. This led him to look for more, which was soon found. He and his mates proceeded on to Ballan with their cattle, and returned to the new Eldorado with pack horses and provisions, and were followed up by a number of others from Ballan. The followers up struck the big flat now called Ballan flat, at Red Hill; and fairly riddled it with square paddocks, 12 x 12. Jackson sent word to Mr. M. Sweet to pack up and come on to Blackwood, saying there was plenty of gold to be found. Sweet made for the top of Mt. Blackwood, and located Jackson’s position by the smoke from his camp fire. He started on the Sunday following to blaze a track to Blackwood. Having safely found Jackson and party, and marked out a claim, he returned to Mt. Blackwood to bring on his effects. Sweet was therefore the second party to arrive on the field. When the knowledge spread that there was gold in the wilds of the Black wood ranges, a big rush set in from all the other diggings, more especially from Forest creek; and on 13th March, 1855, my father and eldest brother arrived here with Forest creekers, and camped on the side of Red Hill, six or a seven weeks before the destructive storm which swept over Blackwood, which is so well described by G. Harvard, the American author, in one of his books, “The Rolling Stone.” Sixteen lives were known to be sacrificed on that memorable night and day. One remarkable incident is told of the storm. A party of Yankees, six in number, were living on the Hard hills, Yankee range, in a large log hut. They had a two logged double bunks in the hut, three sleeping in each bunk. During the night a large tree fell across the hut, killing the outside man in each bunk. The other mates were extricated next morning, and found not to have a scratch on them. The first winter on the field proved to be a very trying one to the miners. Flood after flood swept them out of the main creek, and drove them to prospect in other gullies -Nuggety, Yankee, Tipperary Flat and hill, and Long gully. My father and party marked off a block claim, 12 x 12, on the rich gutter in Long gully, which proved to be a great success. Fifty years have worked a wonderful change in the characteristics of Blackwood.